Founded in 2011, what online brand has built a community of more than 125M women? Hint: They are a media company first and a commerce company second. Hint: They *rock* their social media platforms with news, fashion advice, DIY videos, and fun quotes, memes & pictures. Hint: Here’s something they’ve recently published. Brit Morin founded Brit + Co 6 years ago. Let that sink in… When discussing big brands, we tend to focus on companies that have been around 20….50….even 100 years. Yet, I’m willing to bet that most of my female audience recognizes the brand Brit + Co. You may be thinking…how do I get success like that?! Well, once again, there are some *amazing* tactics and lessons this big brand has utilized that you can apply to your brand. And to my male readership out there, every lesson I pull from Brit + Co can be applied to *all* entrepreneurs looking to optimize their brands. Entrepreneurial Tip #1: Shift your mindset! Being recognizable isn’t reserved for brands that have been around 100+ years. Have big dreams. 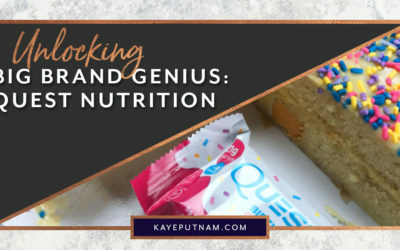 It’s time for this month’s edition of Unlocking Big Brand Genius. First impression from visiting Brit + Co’s website is….. Hold on…I have 5 more articles I haven’t finished reading yet… ???? The Ultimate London Travel Guide for Every Personality Type: Counting down the days ‘til my next trip! Which is *exactly* what a media site wants, and what Brit + Co does so well. The homepage is designed to catch your attention with its most popular articles. Then it’s designed to hold your attention and keep you on the site as long as possible. Immediately finishing one article, you have countless options for the next. Take the above for example. You have a link to visit (assuming) one of Brit + Co’s partners: Visit Britain. You are asked to interact with Brit + Co through Twitter. You see a call to action of subscribing to their email list with an eye catching picture to ensure you don’t miss it! And, in the top right corner, you have the option to proceed to the next article. But, never fear, if you don’t click, the next article magically loads anyways at the end of the page. They also recommend more articles that may interest you based on what you’ve looked at. Overwhelming? Well, you need this overwhelm on your website as well! 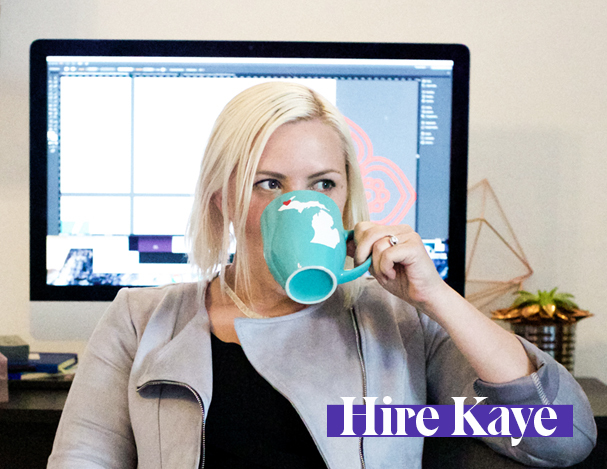 Entrepreneurial Tip #2: Create a website that your audience *wants* to spend time on. Have relevant content. Give clear call to action options. Make it easy to stay engaged when your readers reach the end of a page on your site. Now, onto website design…it’s absolutely gorgeous. Their color choices are bright and fun and very inviting for anyone new to the site. The fonts are complementary, but not overbearing. One thing that’s very popular right now is three fonts. One of those fonts being an accent or script font. While Brit + Co has an italic font they sometimes use in headlines, their few font choices are subdued. This works *so* well for them. Especially in combination with their bright and powerful color choices. Entrepreneurial Tip #3: Never make design decisions based on what’s popular or trending now. Trends come and go, but design decisions that emulate your personality are timeless. Brit + Co’s primary archetype is most likely obvious to anyone familiar with the brand. They are a Creator Brand Archetype. They use mixed patterns and shapes and have DIY videos. They share inspirational stories of designers, artists, dancers, and fashion icons. But what’s even more interesting is how many little details incorporated into their site fit in with Creator traits. These details have nothing to do with the DIY articles or bright colors. Instead, they have everything to do with words, values, and content. Entrepreneurial Tip #4: Don’t underestimate the power of details. Think about your icons, words, stories, names, etc. and make sure they’re all on brand. All the little details are what push your unified message to pro status. Take a look at Brit + Co’s founder: Brit Morin. She introduces herself on the “About” page with a beautifully written low to high origin story. It’s a wonderful mix of Creator Archetype stories. First, going off direction to do your own thing. Second, combining what we’ve been given to create something greater. Brit had a life that many people dream of. She previously worked at *both* Apple and Google and was thriving in the corporate world. But while her corporate life was a success…she explains that she was spending too much time in front of a screen shopping online and getting on demand takeout. So while a lot of professionals would be drooling over this life, she went against the norm to do something that would make her happy. This is when she realized that her childhood memories of creating were still a passion she wanted to keep alive. 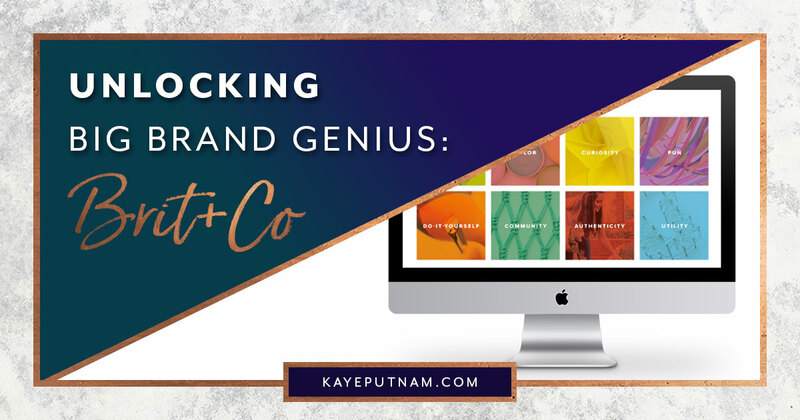 She combined her love of DIY and creating with her obvious knack for business and went to work building Brit + Co. Entrepreneurial Tip #5: There’s power in stories. It doesn’t matter how large your business gets or how many people work for you. Keep your brand personal with stories to ensure emotional, real connections with your audience. Now, take a look at their mission and values. Once again, beautifully written to show the true brand personality of Brit + Co. This is language that Creators everywhere should be incorporating into their content. It emulates passion. Passion for your craft and for helping others find that same intensity in their own lives. 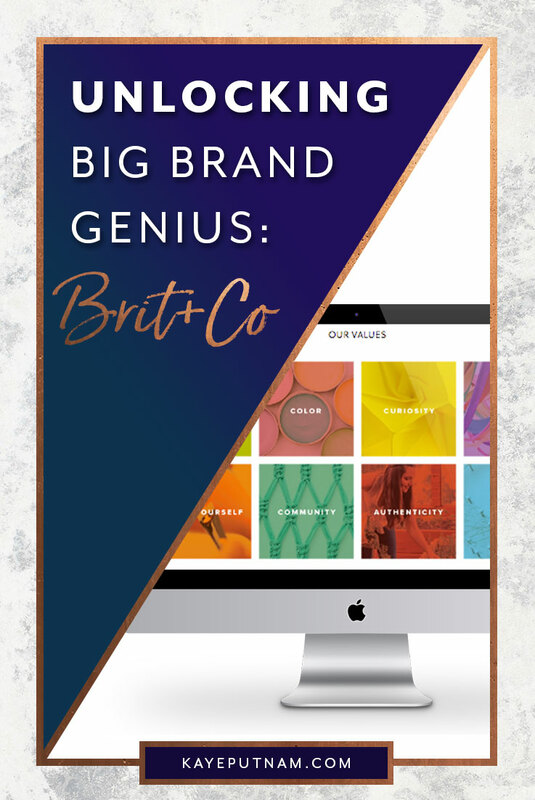 Brit + Co’s secondary archetype emulates most through their media company roots. Their second archetype is the Entertainer Brand Personality. They want their audience to “enjoy the moment” and find the fun in life. Working a corporate 9-5 job? Then look good doing it with their style tips. Or are you hosting a party with friends? Then spice it up with a theme and DIY decorations. They use Entertainer content types like funny memes, videos, and celebrity news. They help their audience forget about the crazy world or stressful job for a minute and indulge in some fun. What’s interesting is that Brit + Co also differentiates themselves with their content. They share empowering articles about strong women and how they are challenging sexist norms and biased policies. They cater their news articles to what matters to their audience. So while it may not fit into the shiny Entertainer Archetype package, it’s true to who they are at their core. Entrepreneurial Tip #6: Your brand personality is your own unique mix. Use archetypes as your guiding principles, but above all, be true to your values and your ideal audience will take shape. Brit + Co is another prime example of marketing through consistent activity on social media. (Did you see my Unlocking Big Brand Genius on LaCroix Sparkling Water?) 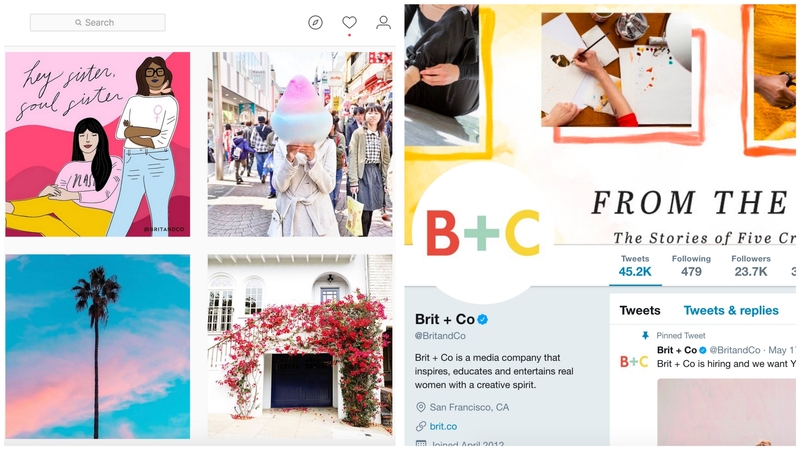 Brit + Co has an active presence on Facebook, Twitter, Pinterest, Instagram, YouTube, and Google+. I’m not sure which I admire more…the number of sites they’re active on or the volume of content published on each platform. But, remember, as a solo entrepreneur, or even a small team, don’t pressure yourself to do it all. Pick the platforms that best accentuate your personality and message. Dedicate your time and energy – and or that of your team – to making those social media platforms shine! Entrepreneurial Tip #7: Be active on the amount of social media platforms you can handle. If you have a large team dedicated to content and promotion, you can handle being active on more sites. Just don’t feel pressured to do it all if you can’t dedicate the appropriate amount of time to each platform. Back to Brit + Co and *their* social media platforms. There is a very specific and crucial tactic I found that entrepreneurs should take note of. 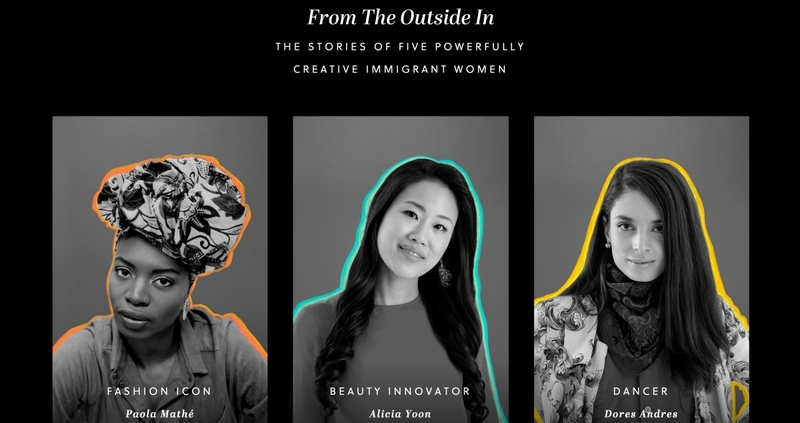 Here, Brit + Co is highlighting their 5 part series on powerful and creative immigrant women on Twitter. Yet, they keep their Instagram platform light and on brand with bright colors and fun imagery. They know that specific content does better on different social media platforms. They utilize this to curate their best resources on the right platforms. Entrepreneurial Tip #8: Keep your content “on brand”, but also keep it varied. You want your audience to recognize your brand, but also stay engaged with what you publish. While you want to keep the same fonts, colors and image style, you don’t want to use the exact same design every time. Next, we can’t talk about social media platforms without talking about consistency. Since Brit + Co is a media company, we can expect a *ton* of content on a consistent basis. You may be thinking…must be nice…all those writers on hand to write up newsworthy and valuable articles. But, it doesn’t stop there. Having content doesn’t automatically mean you have readership and a loyal website following. Brit + Co consistently pushes these articles onto their social media platforms. This demonstrates the high value Brit + Co places on social media as a marketing tool. Part of it stems from their ideal clients, but they also understand one key fact. Social media isn’t going anywhere. It will continue to evolve and you need to as well to hold your place in the market. Entrepreneurial Tip #9: Publishing content to your website isn’t enough. Your social media platforms need to drive traffic to your content. Then, your audience must be able to share that content with their peer groups. 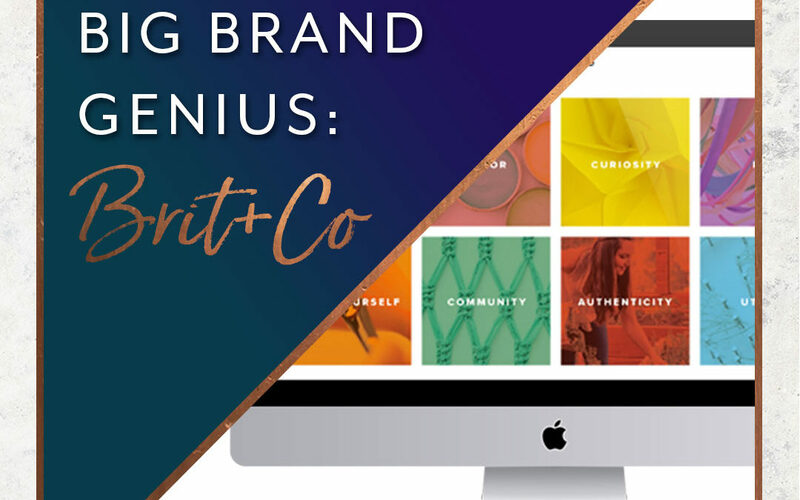 Brit + Co has a genius approach to their ideal client base. It’s the first thing they mention on their “About” page. Because, it’s really not about them, it’s about you! They brilliantly label their ideal clients “Brit girls”. And the description is perfect. After you read it, you (if you’re female – sorry guys) immediately know this is your group of people. They cover all avenues of today’s modern woman – whether we’re outgoing or shy, crazy or creative, shopaholics or DIYers. We all have a creative side that Brit + Co will inspire to come forth! 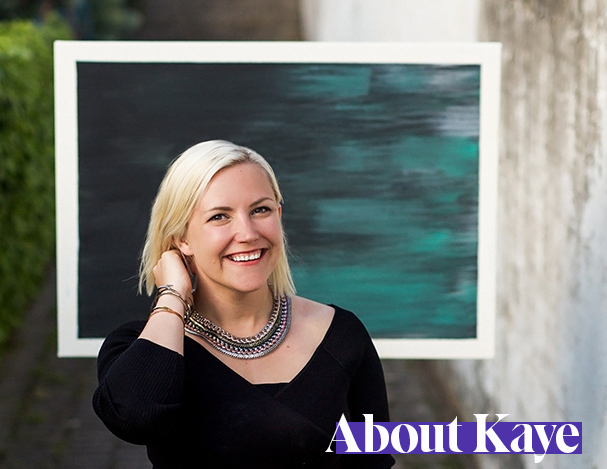 Entrepreneurial Tip #10: Paint a complementary picture of your ideal client. You’ll create immediate desire as your audience realizes you are describing who they are or who they want to be. My completely unbiased, professional opinion…is that Brit + Co is acing their branding. Admittedly, for the sake of this analysis, I spent a lot of time scouring Brit + Co’s website, content, and social media platforms looking for mistakes. I did find there was a link to register for a conference that was over. And I mmmayybeee saw one or two social media posts that had a color scheme I *could* argue doesn’t fit into their brand. But, let’s be honest…what insignificant details to point out in relation to the thousands of posts they publish that are 110% on brand. I’ve concluded that Brit + Co gets an A+++ on branding. 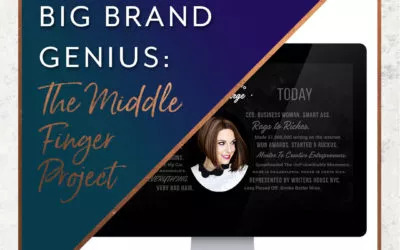 They have built an admirable brand personality and are running with content and tactics that fully embrace the values and emotions of that personality. Don’t try to be a fit for everyone. Brit + Co has an *amazing* following. They attract creative women, and they prove that all women are creative. This works *so* well for them. They empower women dominating the corporate world, and they give advice to mom’s to be. They indulge our ever present sweet tooth and give us an escape from the mundane with celebrity news. They truly have something for everyone on their website. They dominate this strategy, but I would not recommend it for 98% of other brands. Have a niche. Have a specific subset of a demographic that you target. If you try to attract everyone, you usually end up not attracting anyone. Once you dominate your niche, then, and only then, try out a product or service that targets a new group. Part of the reason I got so distracted EVERY time I went to Brit + Co’s website is because they cover *everything*. Really. They write about every topic I could ever have the slightest interest in. In addition to the categories above, you can also read about Travel, Money, Lifestyle, Celebrity Style, Diversity, and *so* much more. Once again, this works for them! They’re a media site first. They need to cover everything so they take that responsibility on like pros they are. Buutttttt, it would be too much for most other brands to handle. First of all, because of resources. Also, because you most likely aren’t passionate about #allthethings. Your unique blend of archetypes narrows down what you are passionate about. So focus on covering those topics with all your focus and you’ll shine.